Earlier today Flickr co-founder Caterina Fake announced the release of her latest startup, Hunch, in private beta. The site revolves around helping users make decisions spanning a wide array of topics. To help users make their decisions, Hunch presents them with a brief series of questions that have been submitted by other members, using their responses to help them make their ultimate decision. It’s a great idea that combines the crowd-sourced nature of Wikipedia with services like Yahoo Answers. But does it work? We’ve managed to get our hands on an invite to the service, and have put it to the test. From the start, it is clear that the site is very clean and unintimidating despite an already-large amount of data. Users are presented with a handful of featured topics on the homepage, most of which have been ‘played’ through many times before so they have complete sets of questions and answers. To the right of the page is a widget enticing users to anwer questions about themselves, which helps the system make more accurate judgements (the placement of the widget is clever – users are constantly invited to participate but aren’t forced to toil through a lengthy initial signup to ‘teach’ the system). And the questions used to analyze users are actually pretty fun (I was asked goofy questions such as “Do you believe in alien abductions” along with more conventional questions like “Where do you live”). The bottom of the home page includes social features, including an activity feed and a listing of active users and members who are most similar (and dissimilar) to you. The site appears to employ a Twitter-like ‘follow’ system, so you can keep tabs on your favorite users. 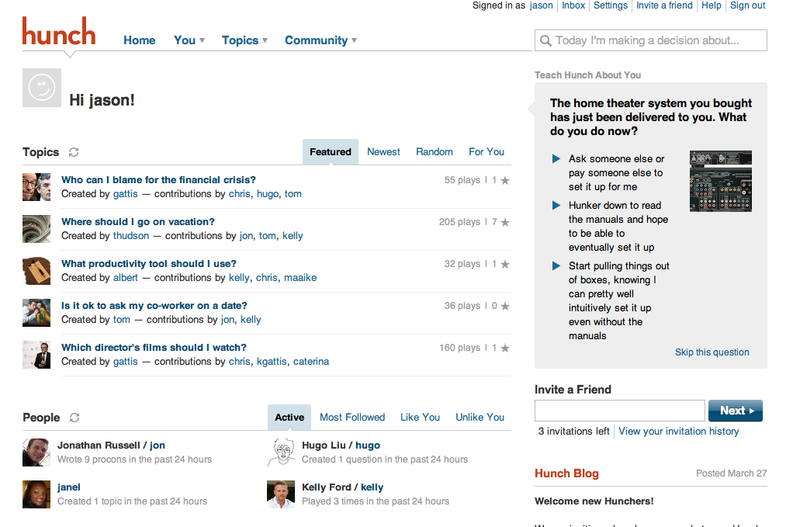 All in all the site looks slick, but does Hunch really have all the answers? At this point the site covers around 500 subjects, ranging from topics on computers and gadgets to relationships and dating. Some of the questions are just for amusement (which Star Wars character am I? 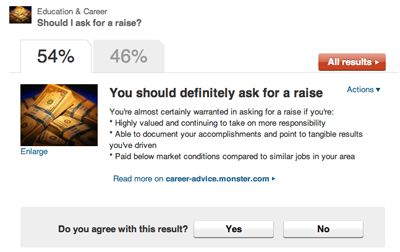 ), but most of them aspire to be genuinely helpful. After picking a question you’d like to have answered, the site presents a series of multiple choice questions (you always have the option to skip a question if you don’t know how to answer it). At the end, the system presents an answer, along with its next-best guesses ranked according to how confident it is with its decision. 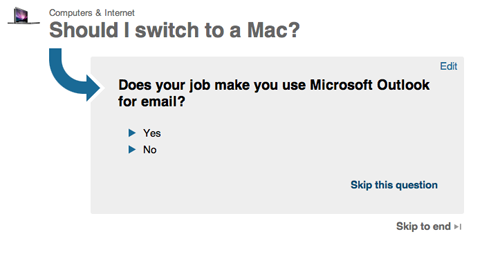 For example, say you were looking to decide between purchasing either a PC or a Mac. The site will present a series of structured questions set up by other users, such as “What do you intend to use the computer for?” In theory this is supposed to be better than asking the question on a general Q&A site like Yahoo Answers, because you won’t have to deal with the bitter flamewars that inevitably result. After entering ten questions or fewer, the system will spit out your answer. 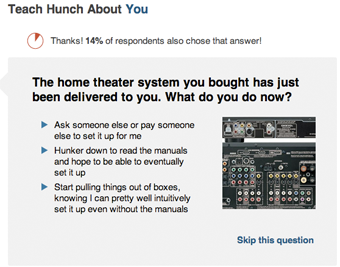 The questions asked by Hunch, and ultimately the decisions it produces, are determined by user input. After ‘playing through’ each decision, users are asked if they don’t agree with the results, and can vote to change the way their answers were judged. Hunch also keeps track of which of the questions it asks have objective answers (“How much are you willing to pay?”) and which of them are more subjective, weighting each of these accordingly and taking the user’s personality profile into account. For those topics that are highly controversial (like the aforementioned Mac vs PC decision), Hunch also tracks items that are seeing a large amount of activity and can regulate them. I ran through a number of trial questions, ranging from deciding if I should rent or buy a car to figuring out a good line to use on a date. For the most part I was impressed, though it quickly became clear that Hunch isn’t capable of magically making up your mind for you. After walking through questions I was often met with answers that were presented with around 55% certainty – not nearly enough to blindly follow Hunch’s guidance. Hunch would provide explanations for why it felt a certain option was best for me, but the fact of the matter is that decisions are rarely black and white, and there isn’t much Hunch can do about that. At this point I’m optimistic about Hunch – the site still has too few users to really be considered comprehensive, but many of the questions and resulting decisions I found were genuinely helpful. That said, Hunch is still going to be fighting an uphill battle: most people have been using resources like Wikipedia, Google, and Yahoo Answers to conduct research for years, and it’s going to be tough to break them out of the habit no matter how well Hunch works.